In 1875, Purdue celebrated its first graduating class, which consisted of a single graduate in chemistry, John Bradford Harper. Though a graduate in chemistry, Harper is historically known as a pioneer in civil engineering. In a time when the federal government was imposing western agricultural practices on native people, Harper played a role that at the time was looked upon as progressive in the eyes of the dominant white culture of the day. The history of Purdue's first graduate is documented in a biography compiled by David Hovde, associate professor of library science. Harper was born in Fort Madison, Iowa, in August of 1855 or 1856, depending on the source. Nothing is known about his early life until he came to Purdue as a junior with chemistry professor Harvey W. Wiley from Northwestern Christian University of Indianapolis, which is now Butler University. During his graduation ceremony, Harper presented "The Search for Truth," a speech discussing the progress of human investigation and the growth of human thought. Harper's speech is praised in several documents, one of which said it showed "a faith in the boundlessness of the capacity of man." Little is known about the first 25 years of Harper's postgraduate career. Additional research by Hovde revealed that Harper headed to Cumberland Gap, Tenn., soon after graduation to join a geology school led by Nathaniel Southgate Shaler of Harvard University. First starting in Livingston, the field school walked 90 miles throughout the Kentucky countryside. Along with daily lectures, the group collected specimens, mapped and surveyed the region, and collected and pickled rattlesnakes. When he next appeared in documents, Harper was not known for work from his chemistry degree, but for a notable career in civil engineering. In 1887, Harper was listed as residing in Durango, Colo. He first appears in local Durango newspapers in the late 1890s. He held positions as the La Plata County surveyor and as the Durango city engineer. In 1900, he was celebrated in one article for his appointment as the superintendent of irrigation for the Pueblo and Jicarilla Indian reservations in New Mexico. "Mr. Harper is a thoroughly competent man, an expert in his profession," the article states. "His appointment is a just tribute to the ability which he has always shown." Harper's most notable work is the Zuni Dam, an irrigation project in Black Rock, N.M., which began construction in 1903 with funds from the Newlands Reclamation Act of 1902. Harper proposed building a hydraulic-fill earth dam, which involved using high-pressure water hoses to blast away the hillsides on either side of the Zuni River, and then filling the dam with the resulting debris. At the time, Zuni Dam was the largest of this type to be constructed. 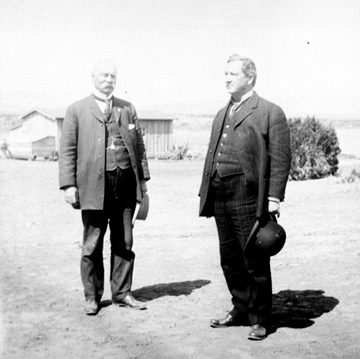 For the construction of the dam, Harper included Native Americans, such as the Zuni, Hopi, and Navajo tribal members, in his employment choices. Harper assigned Native American workers to positions of responsibility as shift bosses, teamsters and equipment operators, which was uncommon at the time. The dam was a prominent display of engineering skill in its time. One inspector of the dam in 1909 commented, "In the course of our engineering experience, we have never seen a finer or better built structure of its class …." However, the government did little consulting with the Zuni tribe before the construction; the dam destroyed a sacred spring and changed agricultural practices for the tribe forever. Furthermore, the location of the dam was a poor choice, and it was quickly obstructed by silt. The dam has undergone three significant redesigns and rebuilds, but it never has provided the amount of water originally envisioned. Harper's four years of dedication to the dam severely affected his health, and he died March 25, 1908 -- soon after completion of the dam-- of pneumonia and heart disease. Harper participated in the American Society of Civil Engineers, and was a founding member of the Delta Delta chapter of Sigma Chi, Purdue's first fraternity. He is buried in Durango's Greenmount Cemetery. A plaque in his honor is present on the Zuni Dam, now known as the Black Rock Dam.